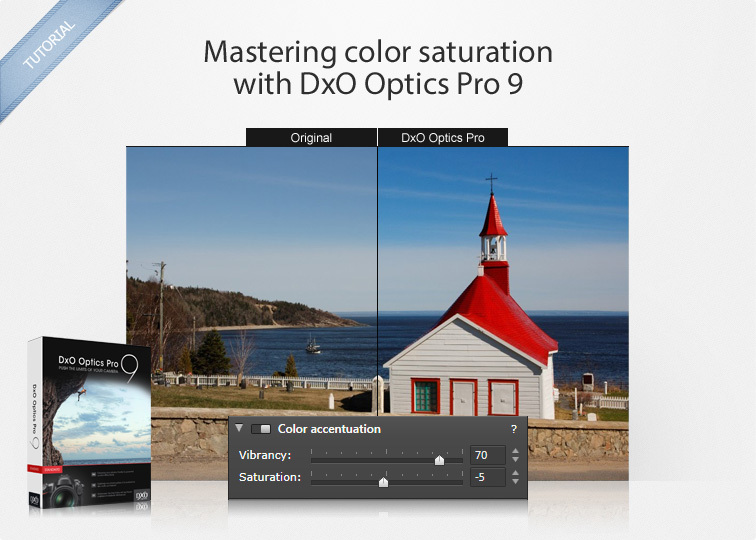 DxO Optics Pro 9 offers a large number of color correction tools. It is possible, for example, to adjust the color by using the HSL (Hue / Saturation / Light) tool or with the tone curve. In this tutorial, however, we will concentrate on using the corrections for Saturation and Vibrancy, whose fundamental differences we will demonstrate here. We will also discuss the software’s exclusive Protect saturated colors tool, which allows you to restore texture and to avoid information loss. The Color accentuation sub-palette is located in the Essential tools palette in the Customize tab. This sub-palette is composed of two sliders — Vibrancy and Saturation — which allow you to give greater liveliness to the colors in your photos. These two corrections function differently, as you will see in our tutorial. DxO Optics Pro, Standard or Elite Edition (depending on your camera). An image in RAW format. You can download our demo images HERE. The Vibrancy and Saturation sliders do not have the same effect on color. Depending on the image you are correcting, you can choose either of these corrections, or combine them. The Vibrancy slider lets you enhance overall tone, focusing in particular on the blues. So this correction is particularly useful with photos framing a blue sky or the sea, for example. Saturation acts on the whole image. All the colors in the image will be enhanced, but more subtly. You can see the combined effect of both tools in the following images. On the left, the original image lacks punch or force. In the middle, we have applied a Vibrancy correction set at 100. The image is already more dynamic, with more intense and vivid blues. Finally, at right, we have applied a Saturation correction of 100 to the image, which reinforces the greens as well as the reds and blues. We advise you to confine your Vibrancy corrections to images showing sky and water, and to pick Saturation in those cases in which you want to uniformly boost all the colors in your photo. Before correcting colors with any tool, we recommend that you first set the white balance so as to find neutral white and gray values (please refer to our tutorial, Adjusting White Balance in DxO Optics Pro). The function of the Saturation slider is very simple to understand: when moved to the right, it allows you to augment the saturation of the colors for the entire image. The default value is 0, so positive values represent a corresponding increase in saturation. 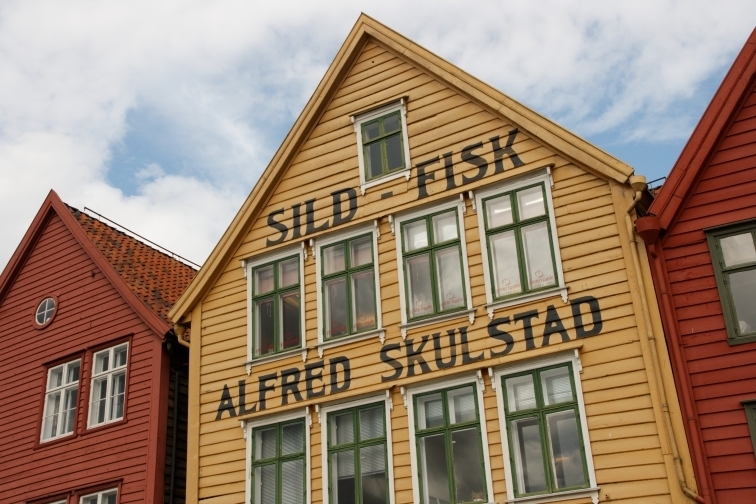 The photo below shows a subject in color, but the scene is a bit dull because of cloud cover. Step 1 – Go to the Customize tab to correct your image. For this type of correction, we recommend that you use the side-by-side display so as to instantly see how the corrections you apply affect your image. 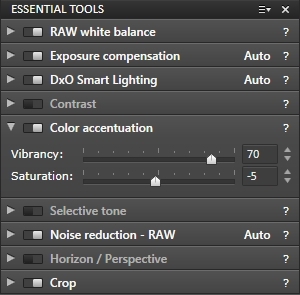 The white balance (in the Essential Tools > White balance palette) should be set to Original — that is, to the value set by the camera. If the setting is correct, we can go directly to correcting the color saturation. Step 2 – In the Essential Tools > Color accentuation palette, set the Saturation slider to 50: the yellow and the red façades immediately become more vivid, along with the green window frames. The blue of the sky is reinforced, but not excessively, and so maintains a natural appearance. Step 3 – You can go even further with this setting. In this photo, setting the Saturation slider to around 75 is certainly possible. On the other hand, if Saturation is set to 100, the orange-red of the house on the right starts to look unnatural — so be careful not to go too far with these corrections in order to maintain natural-looking colors. But contrary to other software programs, a high value for the Saturation slider in DxO Optics Pro does not alter the hue or otherwise distort the color rendering. In addition, the overall contrast in the image is respected. Conversely, you can choose to diminish the color saturation either as a creative effect or because the saturation of the original image seems too strong. Step 1 – In the Color accentuation sub-palette, the image gradually loses its colors as you move the Saturation slider to the left. Step 2 – With Saturation set to -75, the image displays faded colors, giving the photo a pleasant aged or “vintage” look. By setting the Saturation slide to -100, you totally eliminate the colors and produce a grayscale image. However, if you really want to do black & white conversions, we recommend that you use DxO FilmPack, which is available as a plug-in for DxO Optics Pro. 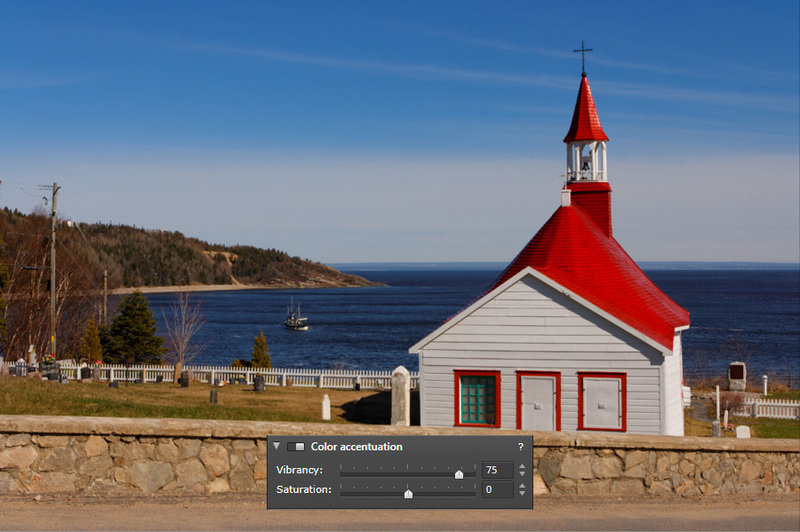 The Vibrancy correction slider functions differently from Saturation by giving more depths to blue hues, which makes it particularly useful when dealing with photos that contain a portion of the sky. By default, the Vibrancy slider is set at 0 on a scale of –100 to +100. Thus a positive value will increase the vividness of the colors, whereas a negative value will attenuate the colors. Let’s take another example. In the following image, the colors are potentially very rich, but the blue of the sky and the waves is quite bleak in contrast with the red and white of the chapel. Step 1 – First of all, make sure that the white balance setting is correct. Then in the Color accentuation sub-palette, gradually move the Vibrancy slider to the right. 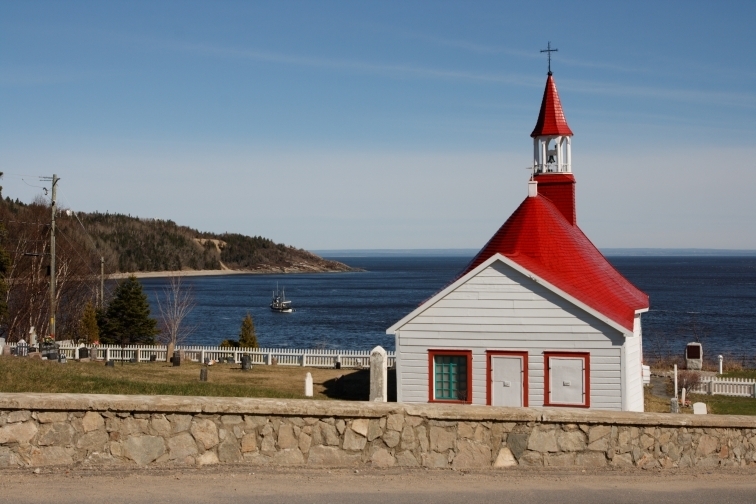 As soon as the curser is at a setting higher than 30, the blue of the sky and the sea becomes more vivid, along with the red of the chapel roof. Step 2 – You can go further with this correction to give even more brilliance to the colors in your image. If you set the Vibrancyslider to 75, for example, you can see that the blue is much more pronounced — both deeper and more vivid at the same time. Step 3 – In addition, you can combine the corrections of both the Vibrancy and the Saturation sliders. In our example, if we want to obtain more vivid blues while slightly reinforcing the reds, we will first set the Vibrancy correction slider to 75, then the Saturation slider to -10. In this way the Saturation correction compensates for the increase in the reds induced by the Vibrancy correction. How you adjust the setting values of the Vibrancy slider depends on the content and the vividness of the colors in the image you want to correct. The Protect saturated colors tool is a DxO Optics Pro exclusive. It acts on the colors that are close to being clipped — either much too bright or too dark. In these cases, there is a significant risk of losing the information about the details and textures in the image. Thanks to this correction, DxO Optics Pro allows you to bring out these textures even in areas with highly saturated colors. The Protect saturated colors process works automatically, since it is part of the corrections applied by the “DxO standard” preset. 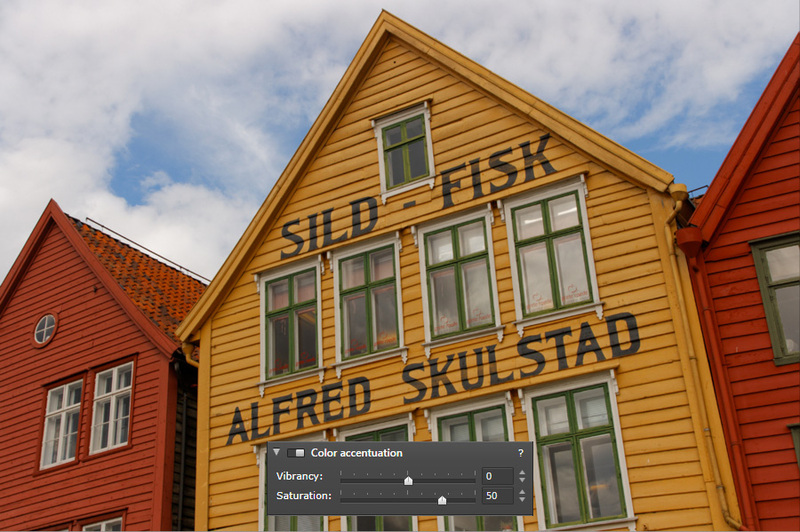 Of course, this automatic correction can be adjusted (in the DxO Advanced User workspace) by using Intensity slider located in Light and color – Advanced > Color rendering > Protection of saturated colors. 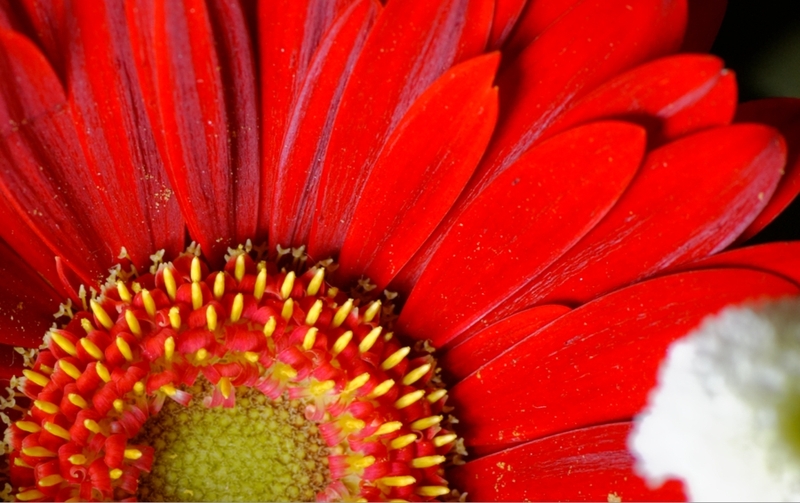 In the following image, we can see that the flower petals have almost no visible details. The textures have been completely eliminated because the saturation is too strong. We will be able to restore the texture of the petals by using the Protect saturated colors tool, which we can do either automatically or manually. 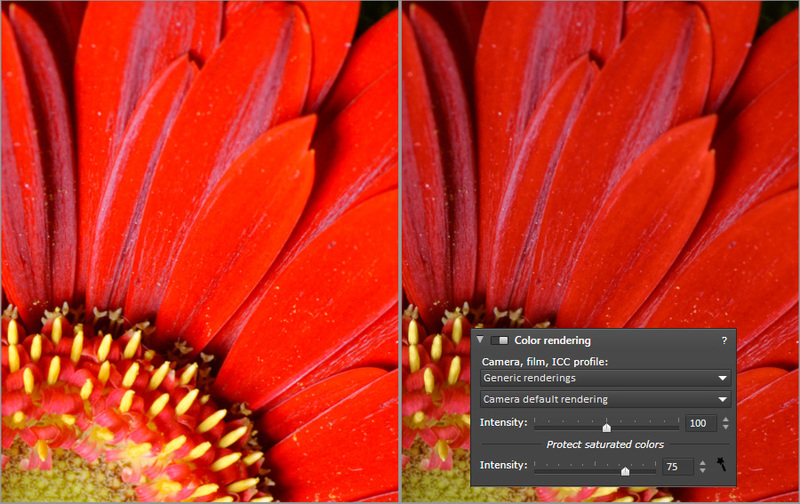 Step 1 – In automatic mode, the setting offered by DxO Optics Pro has recovered the texture in the petals (at right) without altering the original color. The correction Intensity slider is set at 33. Step 2 – If you manually move the Intensity further to the right, you will recover even more information, but you risk changing the red color. Step 3 – You need to find the best possible compromise between bringing out details and preserving colors. In most cases, the automatic setting offers the best possible correction (to return to it, simply click on the wand to the right of the slider). 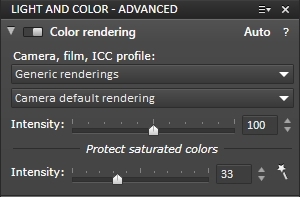 For JPEG images, the Protect saturated colors Intensity slider will have no effect if an available rendering in DxO FilmPack has not already been applied.